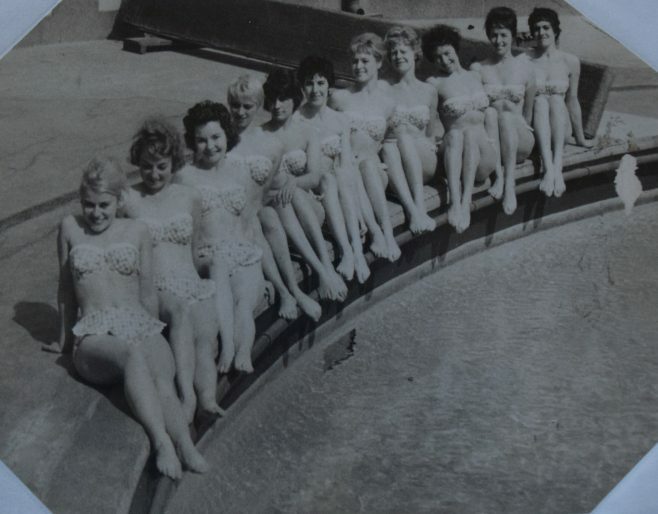 Before the Miss Great Britain competition rounds, 12 ‘Aqua-Lovelies’ would adorn the poolside of Morecambe’s Super Swimming Stadium and put on a fine display of synchronised swimming for the crowds. 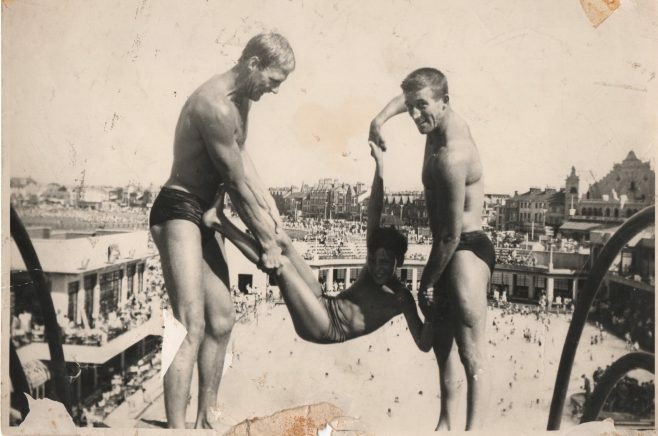 Not to be outdone, male acrobats called the ‘Aqua-Loonies’ presented a diving act from various platforms. Louis Carrick had wanted to become an Aqua-Lovely ever since she was a teenager. She began her swimming career in 1960. A job she describes as “making patterns in the water”, it was a highly skilled profession involving synchronised swimming, dancing, choreography and lots of physical strength. They performed all summer, rain or shine. We had lovely flowered hats on and different suits for each one (routine) so we had quick changes…I had to do a bit of an act with the trampoline and two of the men, and my skirt was going up and silly things like that, we wouldn’t be allowed now. We had a lot of fun but the water was freezing, absolutely. Sometimes we didn’t want to go in but we had to. 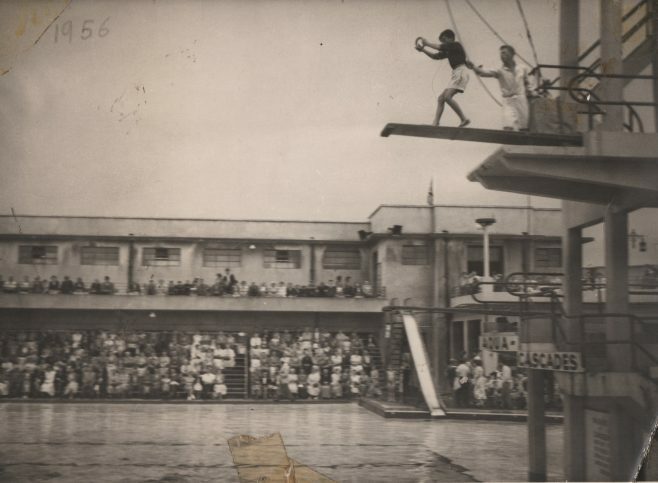 Louis recalls Don Morris, one of the Aqua-Loonies, attaching all their underwear to one of the flagpoles. Bras and knickers were flapping in the wind in the middle of the stadium. She often got the giggles underwater whilst waiting for her music cue. We got up to all sorts of tricks, got told off quite a few times…we were all like a big family really, and the men were like brothers, I mean they chatted you up now and again but you know, I was married. Many of the women were also juggling family life in between the pressures of their profession. Some Aqua-Lovelies arrived at the start of the season as single mothers with little money. The show came to an end in the late 1960s and during that time Louis had three children. She retired as a synchronised swimmer at the age of 42, but still loves the water. 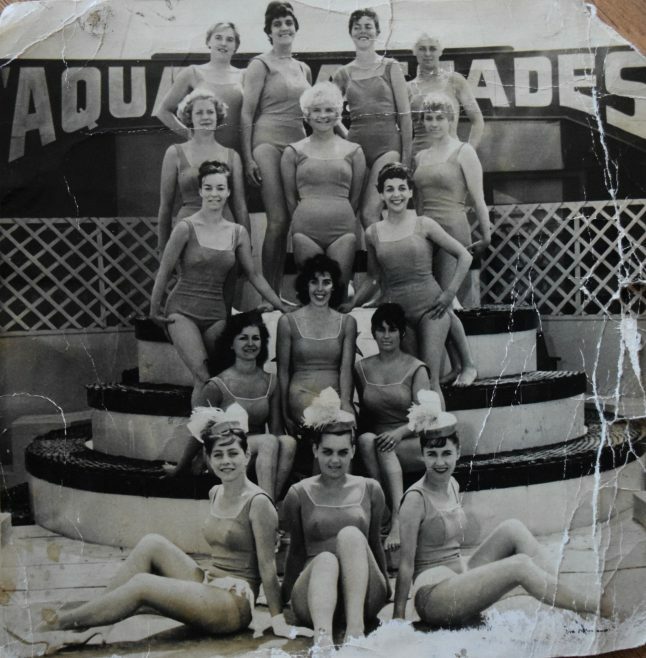 Local lad Charlie Overett befriended members of the Aqua-Loonies and in 1956 ended up becoming part of the performance! He remembers being clouted round the ear several times and chucked off the diving board. These guys were super, like little heroes, celebrities really…there was a performance where they did a lovely display of high diving like a pike dive, a swallow dive and this, that and the other dive, you know, and then there was an Aqua-Loonie show…they’d all act the fool and fall off and roll over and then they ended up putting me in it.